cair collects information about the air quality in your home and sends this data to the cloud, where it is analysed and processed. Using the app you can then view air quality information on your smartphone as well as track asthma or allergy issues if they occur. Dust, ash, large bacteria, and dense oil smoke are some of the other examples of coarse particles . Fine particles cover a range of pollutants, from allergens (pet dander, dust mite droppings etc. ), dense smoke, ﬁne dust and some bacterial spores. Volatile Organic Compounds (VOCs) are chemicals which easily evaporate, quickly spreading and becoming suspended in the air. Temperature plays a key role in maintaining a comfortable and healthy environment. Maintaining a low humidity level can be helpful to people who suffer from asthma and allergies, as both dust mites and moulds favour damper environments. Users interact with the sensor via the app and the cair cloud system. The app is designed to make important features as easy as possible to use. The log event button lets users log an allergy or asthma issues with minimal button presses – this is what helps train the system to deliver personalised alerts. The app will notify you whenever air quality becomes generally bad or of elements of air quality which you are sensitive to. From here you can get a quick overview of the air in your home. Air quality information from each sensor is displayed as a number in a colour coded widget. If you want to learn more about what’s happening over time you can access historical air quality data on the app which is stored online. Alexa is Amazon's cutting edge A.I. home assistant, which is used via the Amazon Alexa app, and Amazon Echo hardware. 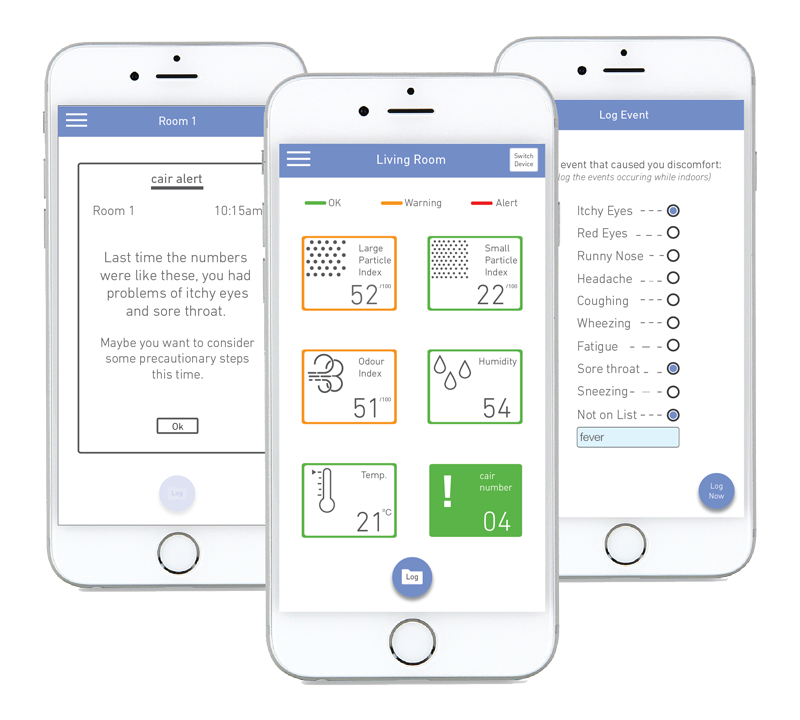 It allows voice activated control of the many internet enabled services that can be found in a modern home, such as music playback, smart light dimming, and smart kitchen appliances. Take control of your indoor environment with cair's Amazon Alexa integration, which makes air quality monitoring more effortless than it has ever been. Simply ask Alexa about the air quality in your home, and Alexa will reply using its specially designed cair features. 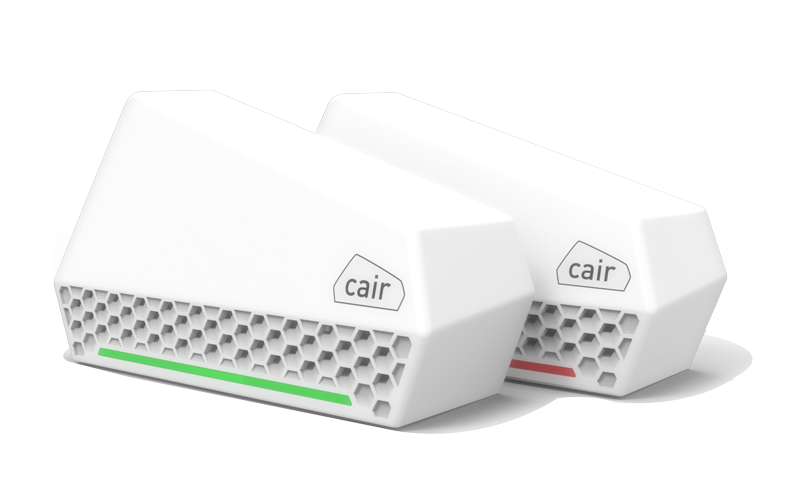 Cair supports the highest level of Alexa integration of any air quality monitoring system on the market. "Alexa, ask cair, what is the temperature right now?" "Alexa, ask cair, what is my air like?" Simple voice commands like these allow you to keep updated about your indoor environment without even picking up a smart device. 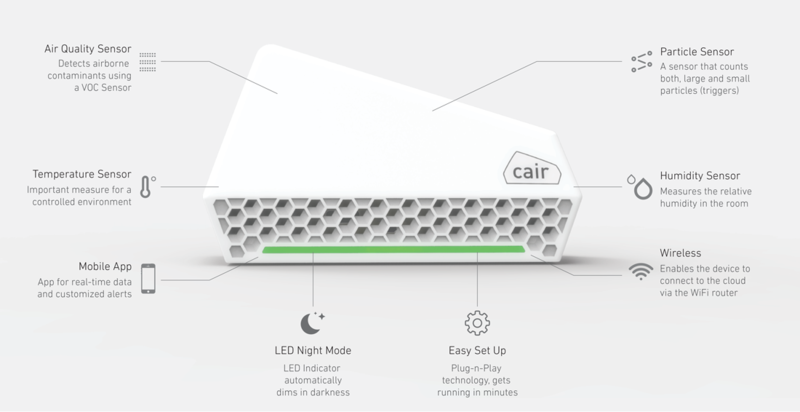 cair collects information about the air quality in your home and sends this data to the cloud, via your home router, where it is analysed and processed. Using the cair app you can then view air quality information on your smartphone as well as track poor indoor air related issues if they occur. Dust, ash, large bacteria, and dense oil smoke are some of the other examples of lagrge (coarse) particles . Small (fine) particles cover a range of pollutants, from allergens (pet dander, dust mite droppings etc. ), dense smoke, ﬁne dust and some bacterial spores. The log Data button is where users log an air-related issues with minimal button presses – this is what helps train the system to deliver personalised alerts.